But when I mention this, I always get questions and comments from people who wonder why in the world I would ever choose oil-based paint. “It stinks,” they say. “It’s so hard to work with,” they say. 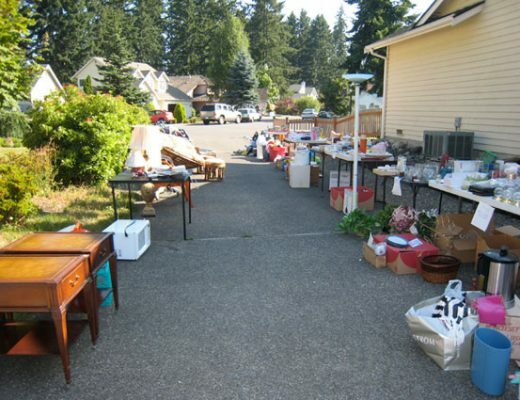 “The clean-up is impossible,” they say. The smell part is true. Oil-based paint stinks. BUT…if you haven’t used oil-based paint in the last ten years or so, you might be surprised, because it isn’t nearly as foul-smelling as it used to be. In fact, when I use it outside, I can barely smell it. The “hard to use” complaint I hope to address soon. It’s true that if all you’ve ever used is latex, then there’s a definite learning curve with oil-based paint. I’ll share my tips and tricks with you shortly. Yes, that’s right…phooey! 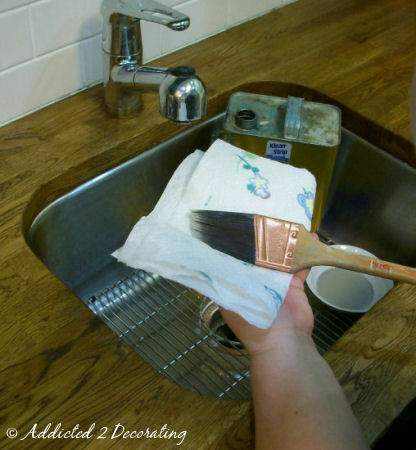 Cleaning oil-based paint out of a brush is easy peasy if you know what to do, so I’m about to show you exactly how to clean your brush in under five minutes without tears, without cursing, and without giving up and chucking the brush in the garbage can. First, you’ll need a non-plastic bowl (glass or ceramic works just fine), mineral spirits, dishwashing liquid (preferably a name brand that claims it “cuts through grease” or something like that), and a couple of papertowels. 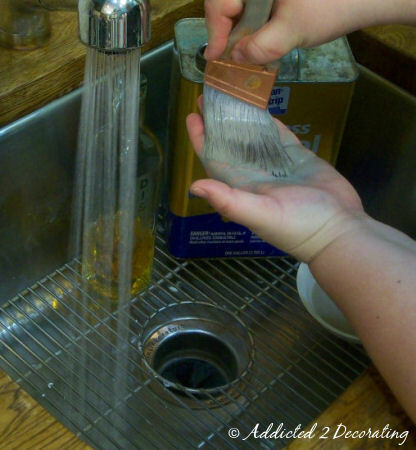 Turn on the faucet, and if you’re doing this indoors, use hot water. 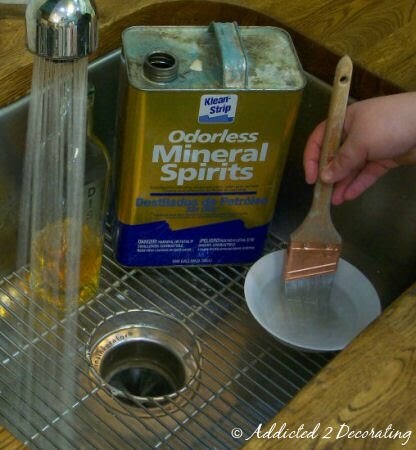 Pour a small amount of mineral spirits into your bowl, and dip the brush into the mineral spirits. Now vigorously rub the brush back and forth over your hand. Be sure to do both sides. Get the mineral spirits worked into the bristles as much as possible. DO NOT put the brush under the water yet!!! 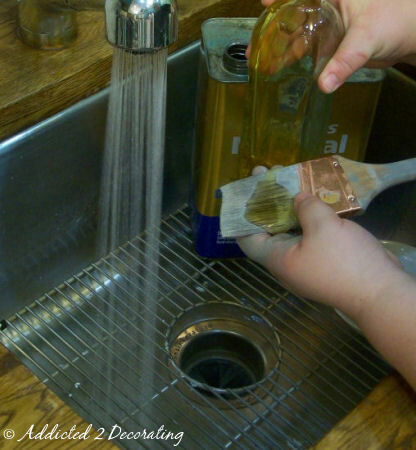 With the mineral spirits still in the brush, pour a small amount of dishwashing liquid on the brush. You really don’t need as much as shown in the photo below. I got a bit carried away. 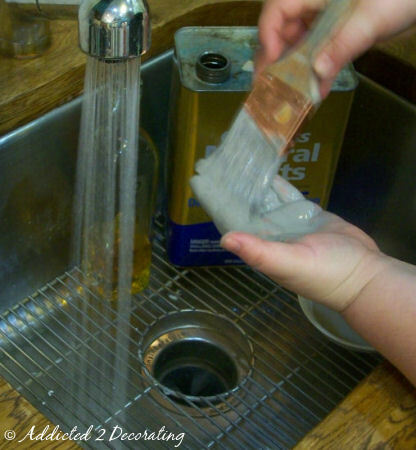 Now rub the dishwashing liquid into the bristles with vigorous back and forth motions. 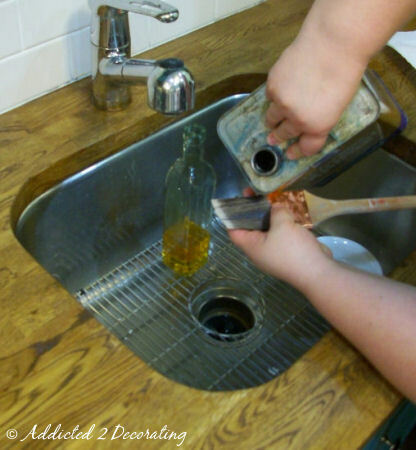 Now squeeze out as much paint/mineral spirits/dishwashing liquid as you can. And then rinse the brush under the hot water, again squeezing out as much paint/mineral spirits/dishwashing liquid as you can. You will need to repeat the above steps several times. On this brush, I repeated the steps exactly five times. When you have repeated the above steps four or five times, and have removed as much as the paint as you can, then pour a small amount of fresh mineral spirits directly from the can onto your brush, and then add a tiny pea-sized amount of dishwashing liquid. Use your fingers to work the mineral spirits and dishwashing liquid into the bristles, but this time don’t rinse out the brush. 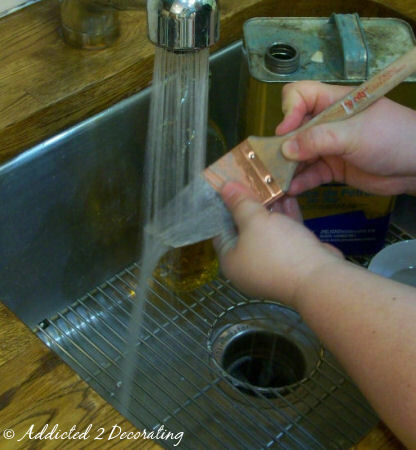 ….and squeeze out as much of the moisture as you can. Leaving that small amount of mineral spirits and dishwashing liquid in the brush will keep the bristles soft…almost like new! And that’s it! It really does only take about five minutes. In the photo above, the brush on the left is one that I used with latex paint. It’s been used on two different projects, wrapped in plastic while wet with paint and left in the fridge overnight once, and cleaned thoroughly. I even used the scrubby side of a sponge on it to get all of the little dried on bits of paint out of the bristles. That’s as good as I could get it. The brush on the right is the one I used with oil-based paint. I used this brush four days in a row, and each night I wrapped it in plastic and put it in the fridge. You can see how beautifully it cleaned up, and in under five minutes. Sooooo…those of you who discriminate against oil-based paint because of the clean up can now mark that excuse off of your list!! I thought it was bad to put mineral spirits and oil based paint down the drain? In our community even the clean up waste needs to go to the hazardous waste disposal center as opposed to rinsing down the drain. Maybe if you did this over a bucket and disposed of properly it would be better for the environment? Love oil based paint and definitely will be sad to see it go!!! This will make it SO much nicer for the rest of the cabinets! Bookmarking this page for sure. You go Kristie! I will have tears when Oil based paint is gone as well…..I love, love, love it and I paint houses every week! I use a similar method and it does work. People always tease me about wrapping my brushes in paper towels like little soldiers but it gets them dry and keeps the bristles soft. When you need to find an alternative to the oil may I suggest Sherwin Williams Pro-Classic Latex alkyd……a totally latex product that has the properties of oil! It works great as an alternative, and it dries in an hour! Yup! An hour! I don't work for them but like I said, I paint every week. It works really well. Keep those great posts coming, I love you and support you in your quest! CC is correct about putting such waste down the drain, but Kristi's method seems to send very, very little into the waste-water stream, so that's a nitpicking point, IMO. I personally despise oil-based paints because they harden in such a way that they eventually WILL crack – meaning that they aren't flexible to environmental conditions the way latex paints are. When they harden, they HARDEN – so much that they just cannot flex with a wood's changing moisture content. So if you use an oil based paint, be prepared for it to crack eventually. Latex paints flex, and that's why I much prefer them. Actually, there is no problem with moisture when you use oil based paints (on dry wood). Moisture does not get through the surface after it hardens. (It’s latex paint that lets moisture through to the wood.) That is why you can wash surfaces painted with oil based paints for years and it stays right there and you repaint when you want to change color. The reason for the cracking is that the surface is not properly prepped. good to know! I have never used oil based paints, no idea why. I guess I just don't know much about them. You're always passing along such great info! Good to know! I"m getting into some painting projects soon. Thanks for the tips. Why run water when an old bowl reserved for cleaning (filled with water) would do? Seems like a waste of water. 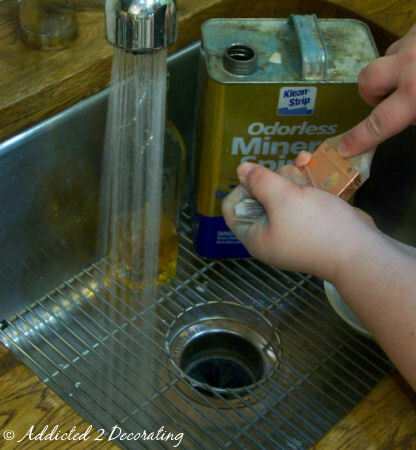 You can easily waste 2 – 3 gallons per minute of running water full blast. If you pay for your water, that is a cost to you. If you are on a well, it cost electricity to run the well pump. Also using rags instead of paper towels would be easier on the wallet and planet. I love your blog but maybe you should look at your impact on the environment more often. Seriously, the environment? Stop drinking the Koolaid already. Our glorious earth will be here long after we are gone. Stop telling people how much water and electricity to use, what type of bulbs to put in their lights, what to put in their body, what kind of bag to use at the supermarket. It’s none of your business how others chose to run their lives. One of the greatest threats to our water resources today is all of the pharmaceuticals that are being flushed down the toilet by our ridiculously over-medicated society, which are causing serious threats to our water and the health of virtually every single American today. You want to get on your high horse about something? Focus on that, and other significant threats to our resources. The two tablespoons of mineral spirits I wash down to clean my brush is like a drop of water in the ocean in comparison to real threats. Anonymous, while I appreciate your concern, I can assure you that when it comes to water usage, my impact on the environment is negligible. Matt and I use so little water that we're charged the minimum allowable usage amount each month. We're literally paying for water we don't even use every month. 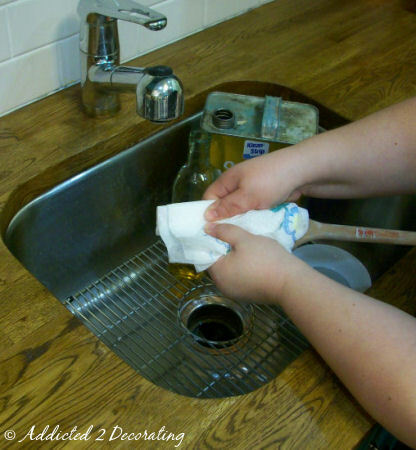 And rags that are used to wipe up oil-based paint must either then be cleaned with mineral spirits (more usage = more impact on the environment), or must be thrown out, and fabric rags are not as biodegradable as PAPER towels. So considering that, I'd say using two papertowels is actually MORE earth-friendly. I am one of your new followers and am I glad I stumbled on to you blog! You have great tips and amazaing projects! You are so talented! But can I ask a question about latex vs. oil? I painted some built-in shelves with SW latex paint (semi gloss) and even after drying for a couple of weeks, there are some places where the paint gouged or pulled up after we put weight on the shelves (books, etc.) I recall reading somewhere that one should only use oil-based paints for cabinets and shelving. Is that your experience? And if I'm going to repaint my shelf, do I need to strip the latex paint off before using oil? Landy, yes…that is one reason I hate using latex on furniture, bookshelves, and other items like that. The "tacky" feeling takes FOREVER to go away. Oil-based paint is much more durable for items like that. With oil, I would still recommend waiting about five days before putting things on the shelves, just to give it time to cure really well. 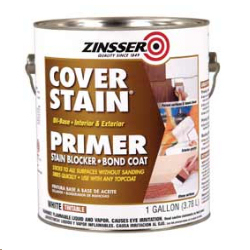 But then you should have no problems, and the oil-based paint will be longer-lasting and more durable. I made the mistake of painting the inside of my kitchen cabinets with latex (because I already had some white paint on hand, and didn't want to spend more money on oil-based paint at the time). I really regret it. For what seemed like months afterwards, when I would use my plates or bowls, and get to the last bowl or plate in the cabinet, it was always stuck to the shelf, and when I'd remove it, it left marks on the paint. I'm not sure if it's because of the climate (I'm in Texas where it's very humid quite often), or what causes that, but it's frustrating!!! I don't think you'd have to strip the shelves completely, but just sand them enough to give them some tooth, prime with an oil-based primer (THAT stuff is what smells AWFUL!!! ), and then follow up with oil-based paint. Thanks for the tips. Oil paint really rocks. When cleaning brushes it really helps to use hair comb on a brush after washing it. I like your recommendation but I can only see one brush in your photo’s? Love your tutorial but I do have one question. because you leave a small amount of mineral spirits and dishwashing liquid on the brush do you rinse it off before you use it again? I would really like an answer for this too since I was wondering the same thing!! If you rinse it before using, then your paintbrush would be wet. But if you don’t rinse it, you’re mixing in dish soap and mineral sprits into your paint? I’m confused! No, I don’t rinse the brush before using it again. The mineral spirits evaporate, and the amount of soap left in the brush is so minimal that it won’t affect the paint. Thank you for this! Found it during a desperate Google search while husband was in danger of destroying the kitchen trying to clean oil paint out of a roller and tray. If not for (a modified version of) your technique, we would still be cleaning. This may be a dumb question, but why do you put the brush in the fridge in plastic overnight? I take it you are doing this for multi-day paint jobs and you plan on using the same brush with the same paint again? How long can you leave it? Thanks your info was soooooo helpful! After rinsing my oil paint brushes in mineral spirits I soak them in hot water & Lestoil for about 30 min. Then rinse with hot water blot out the water & the brushes are paint free. This post is an abomination! He should not be wiping the mineral spirits on his hand! He should also not be pouring them down the drain! Finally, he should have wiped the excess paint out beforehand, on a paper towel! You would fail the OSHA test. Never put paint or hazardous chemicals in a fridge that is shared with food. It’s one of the first things you learn when you work in a lab. Lots of red flags here. I agree with Missy. To comply with OSHA you should buy a seperate refrigerator and have it properly labeled, and the ability to lock it so that no one could accidentally take out your wrapped paint brush and mistake it for a popsicle. Also I hope you are not suggesting that we should be using oil based paints to paint cabinets or shelving in a place of residence. To comply with OSHA I am sure that you must be in a well ventilated area with an air exchange rate much higher than any house ventilation system. I also did not notice an approved ventilation mask, safety glasses, or gloves. If you and your family are somehow still alive after the reckless exposure to all of these hazards, I would recommend in the future that you use an EPA/OHSA approved Union Contractor. I am sure it wouldn’t cost more than $3-4,000.00 to get that little shelf painted the “RIGHT” way. /sarc off. I have a question for you…. I grabbed my oil paint brush to paint some walls with water-based paint! And then I cleaned it with water/soap and didn’t realize I may have ruined my brush until I went to put it away and I noticed it started expanding at the end of the bristles. Is the brush ruined or can it be re-cleaned with mineral spirits and soap? please help! My experience has been that once you use a brush with both latex and oil-based paint, it’ll never really be the same. You can certainly try re-cleaning it. Maybe you’ll have better results that I’ve had in the past. Thank you for the great article and for sharing your experience. This was exactly the information I needed. My brush is squeaky clean and primed with the mineral spirits and a dot of soap.. Now, how do I store it? Do I put it back in the cardboard wrapper it came in or do I wrap it with paper towels, or do I wrap it in plastic?? 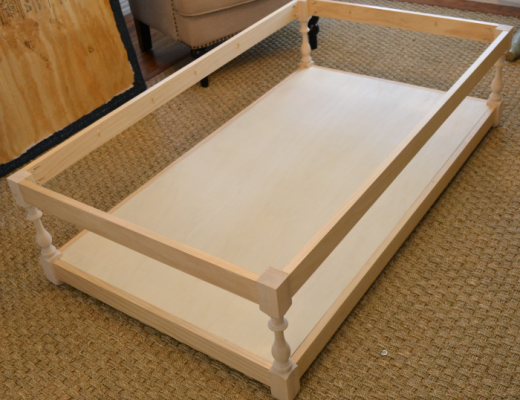 If you have a place where you can hang it up, like a peg board in the garage, that will help protect the bristles. If you put it back in the original cardboard wrapper and then hang it up, even better. I too am a big fan of oil based paints. My question is about wrapping it in plastic and putting in the fridge. I have done this with latex, but not oil. I have always been afraid to try it, didn’t want to mess up my good Purdy brushes. So, you can do it with oil too? 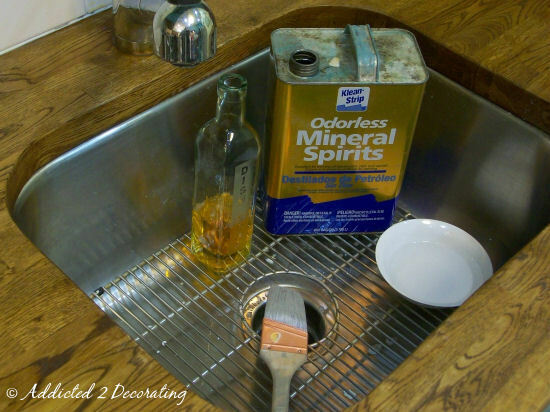 Do you put a bit of mineral spirits on it before starting your painting again? Yep, you can do it with oil-based paint also, but it won’t keep as long as latex paint. 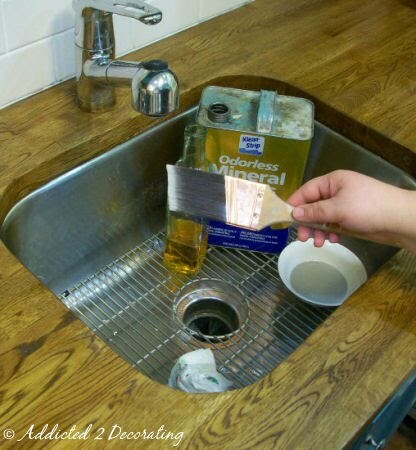 With oil, you have to use it the next day or it will start to dry out. I also find that it’s best to get it out of the fridge and let it warm to room temperature before using the brush again. I only put mineral spirits on it if I absolutely have to, like if the tip of the brush has started to dry out a bit. Mineral spirits are highly toxic. It says so on the packaging. Do not handle naked hands, and do not rub it into your naked hands. Wear rubber gloves. Wash your hands after use, and wash any areas you spilled it on (on yourself and otherwise). Make sure you open it and use it in a well ventilated area. Open it away from your face when you open it. Hi, great post. but where is the left and right picture you mentioned to compare the brushes with different base paints? I use the Paint Piranha to clean my brushes, only takes about 5 minutes. If your a professional painter and use paint brushes and rollers all the time would it be cheaper to just use new paint brushes every day? I think advocating cleaning your oil based paint and poring thinners and paint down the drain is bad practice. Think about it, if thousands of people were to do that, there’s already enough amount chemicals being released into our already polluted water supply. Please dispose of your chemicals responsibly – don’t be ignorant. Thank you for this! I used an oil based paint on some wood for a piece of furniture I made and had no idea of how smelly and how hard it would be to get out of my brushes! 1st time painting wood and using an oil based (high gloss) paint, and this really helped/ allowed me to keep my brush (versus throwing away which I was about to do)!